The earthy colors of travertine tile make an ideal choice for kitchen floors. The limestone in travertine tiles lends to unique color and designs and is durable in high-traffic areas. 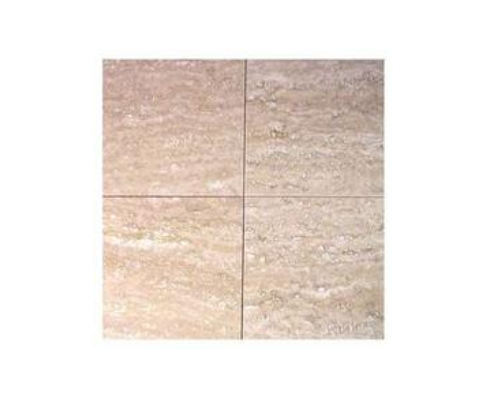 Travertine tiles are naturally porous and are typically sealed to protect the floor materials from absorbing stains and substances that can cause discoloration, dullness and etching stains. While your travertine tiles will require a fresh coat of sealant once each year to maintain shine, proper routine care is also important since using the wrong cleaning products can dull their look. Firstly, Sweep the floor with a broom and dustpan to remove all dirt and debris. Secondly, attach a natural hair sanding pad to a floor buffer. Plug in the electrical cord. Thirdly, sprinkle 1/2 cup of polishing powder over a 4-foot by 4-foot area of the travertine tile. Drizzle 1 cup of water over the polishing powder. Fourthly, run the floor buffer over the travertine tile until the polishing powder and water turn milky white. Add more powder or water, as needed, to create a gritty solution on the tile surface. Repeat Steps 3 and 4 to polish the entire travertine tile surface.